Home » Personal Finance » Are You Making the Best Use of Financial Technology? We live in a world where you can access your finances in the palm of your hand. 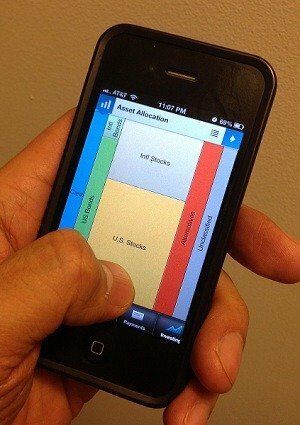 There are numerous financial apps and tools at your disposal. All of this technology is supposed to help you stay on top of your financial situation, and possibly even save money. But is it working? Does all this financial technology really help consumers make the most of their money? Only 46% of users have improved their ability to save as a result of online access to their financial information. 3% of Americans use financial applications to manage their investments. 3% of Americans use these apps for the budgeting tools. Women use finance apps more than men, but they are less likely to say that these apps actually help them save money. 36% of Americans use online banking to pay their bills. The survey indicates that financial apps encourage people in most age groups to better track their finances. Beyond that, though, financial technology is largely going to waste by many consumers. Who is Getting the Most Benefit from Financial Applications? While tracking your spending is a great way get a handle on where you stand, and avoid overspending, many consumers don’t use this information to take action to improve the financial situation. And, even though some personal finance software, like Mint and Personal Capital, will make suggestions to you about how to save more money or reduce fees, few consumers are using technology to save money. The exceptions to this rule are those who earn at least $200,000 a year, and use financial technology for multiple functions. According to the COUNTRY survey, 71% of those who make at least $200,000 a year save more money because of these financial applications. Many of those at this income level use multiple tools, for multiple purposes. Can Financial Technology Help You Reach Your Money Goals? The key seems to be in understanding how financial technology can help you reach your goals, as well as in realizing that having certain information can help you make better decisions about saving, spending and investing. While some consumers (26%) use financial applications to check their balances, there is a good chance that they could be doing more with these tools. First of all, consider the personal finance software you use to track your spending. What other features does the software have? Many software applications offer budgeting tools that can help you set up a plan to save money over time. Are you utilizing these tools? You can also use financial technology for specific purposes. There are apps that can help you find and organize coupons, right on your mobile device. There’s an instant way to save a little money. It’s also possible to use online tools to manage your investments, and do research. Could you be investing in something with a lower cost? With the help of stock screeners and other apps that you can access online and through your mobile devices, you can find just what you’re looking for. On top of that, there are financial calculators and apps that you can use to calculate how much you should be saving for retirement, whether or not it makes sense to refinance, and the impact of inflation is likely to have on your purchasing power. It makes sense to use these tools, if you have them at your disposal. Think about your financial goals, and determine which tools might be most likely to help you accomplish your short-term and long-term financial goals. In fact, you should probably look at the financial apps you already have; chances are that you could be getting more use out of them. What’s your favorite financial app? How do you use technology to better manage your finances? Great article. I have been a Mint user for a number of years now. It has been great but I have been a bit disappointed in that the product really hasn’t evolved much lately. I recently started using Personal Capital and like how accurate it is with respect to my investments, much better than Mint in that respect. I have been using this new tool from GoodApril (www.goodapril.com) to help with my tax planning which has been helpful to plan for all the tax changes happening in 2013. Great Post, All tools are helpful for us for manage finances budget. I am agree with your point, today most of people using android & iPhone app that’s easy to access finances issue and manage, currently I am using Mint & moneystrands app for iPhone that app make my life easy. Yes, technology to better manage my finances. I think one reason why they don’t save more money is because they may not know how to budget themselves. For me personally financial applications have been superb. I now use online banking everyday, have a banking app and credit card app both of which help me maintain financial discipline over my finances. I love it.